echo 300c is the only color, dual-beam fishfinder on the market at this price, making it the premier sonar option for fishermen on a budget. echo 300c is designed to make catching fish a cinch. It’s just that simple. 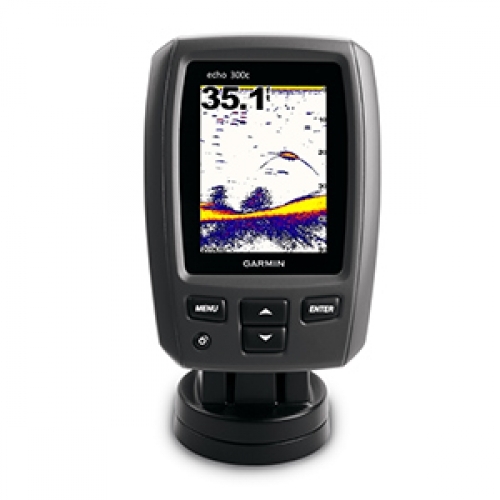 The system’s 3.5" (8.89 cm) sunlight-readable display and exclusive Garmin HD-ID™ target tracking technology let you see through the water like never before. Plus, a 300 W (RMS) sounder offers a viewing angle of up to 120 degrees and bottom detail to 1,500 ft (457.2 m). For an uninterrupted view of the sonar image, echo 300c also boasts Garmin Smooth Scaling™ technology, which means you won’t lose sight of the sonar history as the unit changes depth ranges.